So I find that Microsoft has once again decided to switch things up in the Excel world with the xlsx file format. Why would you not build in backwards compatibility? Because you choose to make it inconvenient in hopes of forcing people to buy your new product? Fortunately they do have a tool to allow you to open the new format in your “old” program. However to use it you need to update your Microsoft environment and even in this age they FORCE you to use Internet Explorer. I fire up Internet Explorer (I used it very very rarely) and go to Microsoft and the first thing that they do is of course ask me if I want to be part of their beta program for the Silverlight Download Center. Why? What advantage to me? No. Next they require me to download the validation tool to be sure I’m not cheating them. 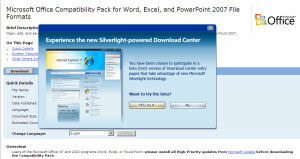 Now I can really go get the “Microsoft Office Compatibility Pack for Word, Excel, and PowerPoint 2007 File Formats“. Hopefully it works and I can open my Office 2007 file in my Office 2003. What a bother. I much prefer Open Office anyway, but this time it didn’t work for me to open the Office 2007 file. I bet that won’t last long. Well I hoped for the underdog — even if it makes Michigan’s Tom Brady lose to Michigan State University(ishes) Plaxico Burress who actually broke down in tears after the game in his interview. It was a great game. I didn’t see it being close. I didn’t see the Giants winning. Congratulations to them. That should put spygate to rest too so that we need not hear more about it. The most interesting things to me? 1. How lame that the NFL insists on running a play with one second left when the Patriots were willing to concede. They need to adjust the rule book for that situation to permit a coach to finish it under that circumstance. 2. A regular guy, 185 pounds, 5′ 09″ was the MVP in my book had the Patriots won. Their goto receiver was a normal sized guy, Mr. Welker — and he is a Mister after that gutsy performance. Of course then “they” name Manning when it should have been a defensive player in a defensive game. 3. Speaking of marketing … the NFL has a page on the Superbowl?? 4. Best Ad Series? Probably Bud Light or Coke. It was a toss up. The auto ads were uninspired and boring. 5. Godaddy.com sells you to their site. Up until now Danica has avoided the overly sexist advertising pushed by Bob over at Godaddy. Unlike Amanda (I’m really too skinny but who cares) Beard and What’s her Name — I have fake everything but I can wrestle, Danika has remained above that garbage … until this ad. Oh well, I guess money talks. I had some concerns for them late in the game when a lot of their defensive players were hitting the deck with cramps and such, and I wondered if they were out of gas. They kept bouncing back like a team of energizer bunnies. One little side note for me: I am currently working on a site called cool-off.com. That site markets misting systems including large fans with misting heads in them. Often you see them in big sporting events in humid arenas, including in the Superbowl (they also make misting systems for everything from residential decks to industrial facilities). The television cameras often show the players sitting in front of the cooling fans on the sidelines trying to stay cool. What fascinates me the most is the fact that the mist is apparently vaporized within inches of the nozzle and so you never get wet with this type of cooling system. I don’t know that this particular company provided them for this event, but I guess my selective perception is heightened at present and so I notice them. What does your selective perception bring to the fore front for you when you see a game of this magnitude? I knew I wasn’t the only one! News.com.au reports that the proportion of Australians using Mozilla Firefox to surf the web is among the highest in the world, according to internet trend research. The article goes on to say that almost one in three web users in the Oceania region – 31 per cent – were using Firefox, compared to 28 per cent in Europe and 21 per cent in the US. Those are pretty interesting statistics, and I must admit that I was surprised at the comparatively low utilisation amongst US users. Any thoughts as to why? Check out the full story: Australians embrace open source browser. The article has attracted some emotive comments on the News.com.au site, so it’s pretty clear that folks (I would guess a fair chunk of web developers) are still very passionate about their browser of choice! Currently browsing the HTMLfixIT news & reviews article archives for February, 2008.